Kirk Aoyagi is energized by the challenge of creating landscapes to complement the distinctive architecture in Los Angeles using the latest technologies and most sustainable practices. Kirk is a leading expert in sustainable landscaping with a deep understanding of sustainable landscape-supporting technologies, particularly those related water conservation. As an EPA-accredited WaterSense manager, a certified water manager and CLIA, Irrigation Association licensed irrigation auditor, Kirk has in-depth, leading edge knowledge of sophisticated irrigation, weather based controllers, runoff prevention and mitigation, biological water features, drainage and cisterns, and permeable surfaces. This knowledge supports the FormLA team’s ability to develop water wise landscapes and also retrofit existing irrigation systems and landscapes to conserve water. 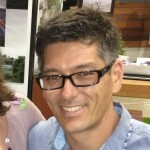 Kirk and his wife Cassy founded FormLA Landscaping as C&K Landscape Design in 1997. By 2000, their interest in ensuring everything their clients experienced was “just right” led them to building a full-service landscaping company. Cassy and Kirk’s work has been featured in a multitude of Los Angeles garden tours, and garnered significant press coverage. 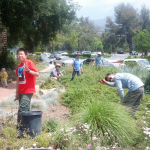 Kirk is a registered sustainable landscaper and a licensed landscape contractor. He and his wife Cassy earned bachelors of science degrees in environmental horticulture science at California Polytechnic University, San Luis Obispo.